"Are you earning an income but struggling to get by? Have too little money in the bank? Feel like you’ll never gain any traction on that emergency fund you know you’re supposed to have-- let alone start saving for retirement? Finally, are you ready to eliminate those nasty credit card bills? 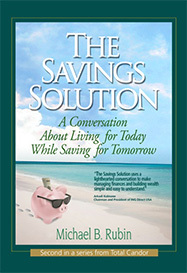 Financial expert Michael Rubin will speak at RiverRun Bookstore in Downtown Portsmouth on Monday, May 7th at 7:00pm. RiverRun is located at 142 Fleet St."
This book is, as the title indicates, a conversation about personal finance. The author is talking with "you" through most of the book. This is a bit of a gimmick, but it works well to keep the reader moving through the explanations of stuff like compound interest. As you read along the questions that pop into your head as you read ("where am I gonna get 8% on my money? ", "what if Ididn't save $10 every day since I was 21? ", "isn't that a quote from My Cousin Vinnie?") are written into the text and answered directly (in the stock market, you need to get on it today, yes). The end of each chapter has a series of entries based on postings from the author's blog.